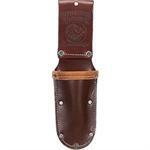 pouch | Product tags | Waltco Tools & Equipment, Inc.
Our most popular hammer holder! The steel hardware is sandwiched between two layers of premium 12 oz. leather for comfort and years of durable service. 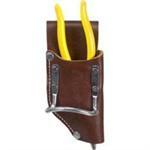 Specifically designed to accommodate most pliers and side cutters. Ideal for Felco and other pruning shears. 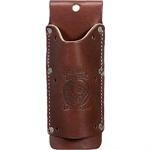 Universal holster with open bottom. Features- * Two pouch all leather tool bag features holders for pencils, work knife, chisel, level, lumber crayon, plus a heavy duty hammer loop. * Additionally, the tape holder fits up to a 35' contractor's tape including the FatMaxTM. 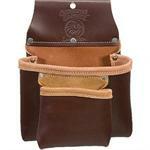 * Tool Bags hold the tools most often accessed with the right hand (hammer, pencils, utility knife, chisels, etc.) and are worn on the right side of the body. * Additional two medium outer pouches in lieu of one large outer pouch. 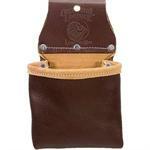 Specifications- * Pockets & Tool Holders: 11 * Weight: 2lbs. 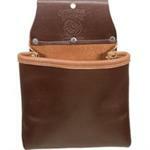 * Main Bag: 9" x 8" * Outer Bag: 5" x 5.5"
Features- All leather compact pouch. Great for that third bag in back. Specifications- Weight: 0.7 lbs. 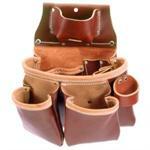 Main Bag: 7.5" x 8"
This rugged 2-in-1 holder offers twice the tool capacity in the belt space of one item. Designed for professionals and weekend warriors. Add it to your tool belt or use alone. 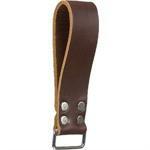 Sturdy 12 oz English Bridle Leather ensures years of endurance in the field. Two pouch all leather bag without internal tool holders. * For those who need a straightforward serviceable utility bag. Specifications- * Weight: 1.3 lbs. * Main Bag: 9" x 8" * Outer Bag: 5.5" x 5.5"
Our largest all leather bag. This 10" deep bag fills many needs. Specifications- * Weight: 1.7 lbs. * Main Bag: 10" x 10"
For pliers, side cutters, crimpers, etc. * A great addition to any tool belt! * Tape measures, clip-on bags, meter cases, and anything with a clip easily attaches. * Quick release design for ease of use. 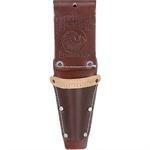 * All leather holster designed originally for steel framing. * Works great for many other applications where the WISSTM WS1, 2, 3 snips are used. * Also fits many other tools. 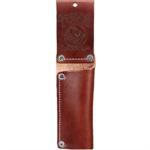 Makes a great "no-swing" leather hammer holster as well. Specifications- * Dimensions (w x h): 2.75" x 5.5" * Weight: 0.3 lbs.